The title of this book is "undercover" for a flash pasteurizer design guide. 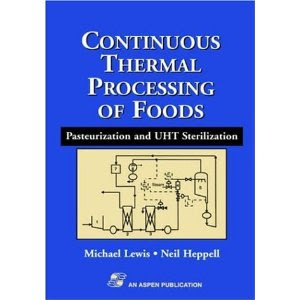 Continuous Thermal Processing starts with the the basics of "how much heat" for "how long" it takes to kill particular bacteria and accomplish a pasteurization or sterilization process, and really doesn't stop from there. Everything from flash pasteurizer P&ID diagrams to single heat exchanger and other component specification, its complete with the calculations which derive a number of equations from scratch, and goes on to quick reference tables. The book was based on an early version and has expanded its range by new authors in this new edition to include far more than dairy applications. Its found to be extremely thorough including later sections in heat exchanger fouling, and machine CIP. This book is available through Amazon.Com by clicking the link below. Note that it is a a part of the "Food Engineering Series" which are all equally as interesting.